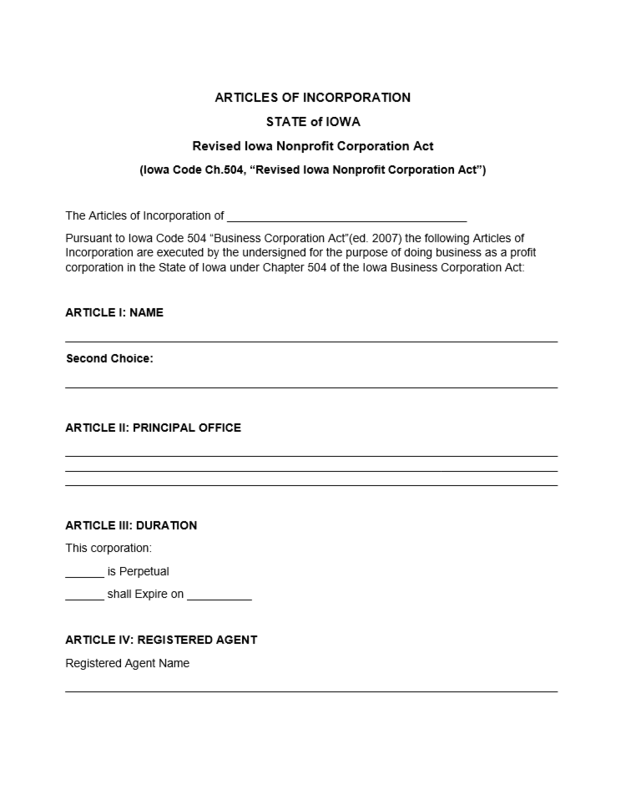 The Iowa Articles of Incorporation Domestic Nonprofit Corporation is a template form which outlines the minimum amount of information that must be submitted to the Iowa Secretary of State. Some entities will need to handle these articles in a variety of ways. A good example is when one wishes to apply for Tax-Exempt Status in the future. When this is the case, the Incorporator must include IRS compliant 501(c)(3) language in the purpose. This does not automatically grant Tax-Exempt Status. Only the IRS may grant such status and this must be the result of a process set forth by the IRS. It is strongly recommended to contact the IRS directly regarding this process before filling out or submitting these articles. This form must be submitted with all documentation along with a $20.00 payment for the Filing Fee. It would be considered wise for an Incorporator to be absolutely clear regarding this process thus, it would be considered wise to consult an Iowa attorney or accountant before filing these articles. You may mail these articles to: Secretary of State, First Floor, Lucas Building, 321 E. 12th St., Des Moines, IA 50319 or upload them directly to the site (as a PDF) here: https://sos.iowa.gov/file/origination/index.aspx. Step 1 - Select the “Download Form” link above. You may save this as a PDF and fill it out with a valid PDF program or you may Print it then type it out. Step 2 - On the first line, enter the Full Name of the corporation. Step 3 - The first article, “Article I: Name,” will have two available blank lines. On the first line, report the Full Name of the corporation you are forming. Unless you have reserved the Name it may be unavailable. The second line is provided should this be the case and is optional. Enter your second choice for a corporate Name should the first one be unavailable. Step 4 - In “Article II: Principal Office,” enter the Full Address of the Principal Office. This may not be a P.O. Box as it must be the physical location of the Principal Office. Step 5 - The third article, “Article III: Duration,” place an “X” on the first available blank space if this corporation intends to operate perpetually. That is, if it has no intention of dissolving. If the nonprofit corporation does intent to dissolve on a specific date, then place an “X” on the space before the words “shall Expire on” then enter the Date of Dissolution on the space after this phrase. Step 6 - Next in “Article IV: Registered Agent,” enter or type in the Full Name of the Registered Agent that shall receive court documents on behalf of this corporation. Step 7 - Article IV will continue on the next page. Under the words “The Registered Agent’s Registered Office is located at:,” report the Physical Address of the Registered Agent’s Registered Office. This may not contain a P.O. Box. Step 8 - The final section of Article IV should only be filled out if the Registered Agent has a separate Mailing Address then the one listed above. If the Registered Agent has a separate Mailing Address, report this Address under the words “The Registered Agent’s Mailing Address (if different) is:.” If not, you may leave this section blank. Step 9 - “Article VI: Incorporators” Incorporators” will call for a full listing of the Incorporators of this nonprofit corporation. 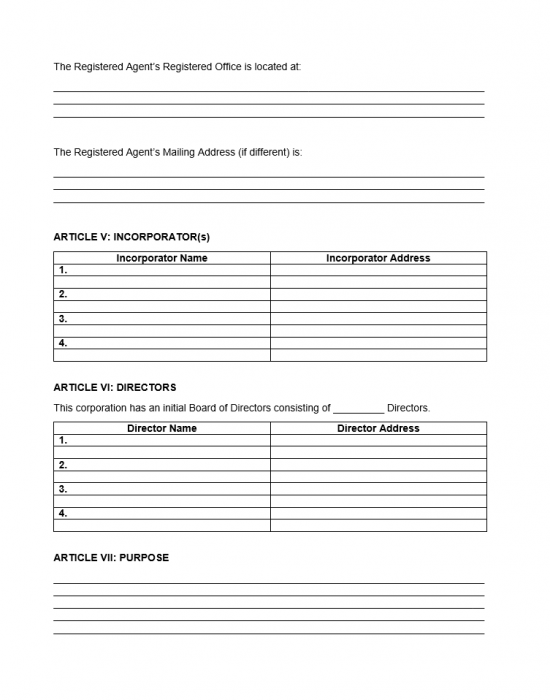 Report the Full Name and Full Address of each Incorporator in the table provided. If there is not enough room, you may continue this list on a separate sheet of paper then attach it. Make sure this is clearly labeled. Step 10 - In “Article VII:Purpose,” give a full description of the Purpose for this corporation. That is, how will it operate and why is it being formed. Step 11 - In “Article VIII: Members,” a statement will seek to define if this corporation shall have members or not. If this corporation will have members, report this by placing an X on the first blank space available. If not, then leave the first blank and mark the second blank space. Step 12 - In “Article IX:Dissolution,” describe how the assets and property of this nonprofit corporation will be handled and by who. Make sure this is a complete account of all powers involved. Step 13 - “Article X: Provisions” is provided to include any additional information, forms, requirements, or terms necessary for the formation of this corporation. Step 14 - The statement below Article X will require the current Date to be entered on the blank space. That is, the Date these articles are completed. 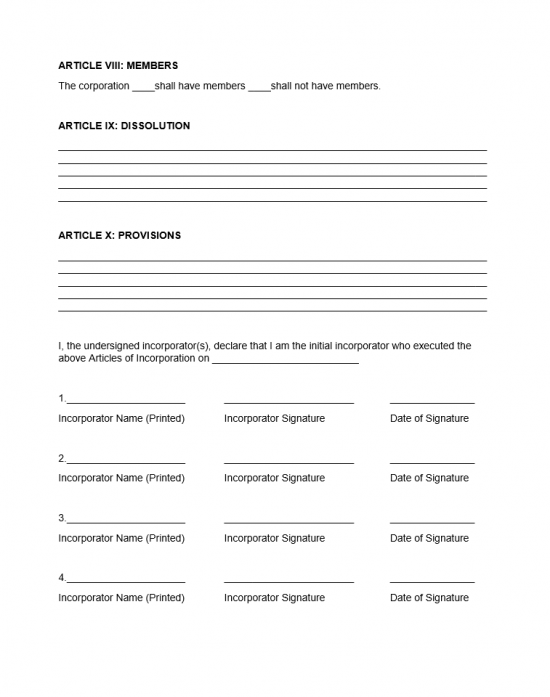 Step 15 - The Signature section shall provide a space for each Incorporator’s Printed Name, Signature, and Date of Signature. This must have the Signatures of all Incorporators listed above. Step 16 - Next, organize all your documents with two copies of the Iowa Articles of Incorporation Domestic Nonprofit and a check for $20.00 made out to Secretary of State. You may either email these documents or send the paper forms to the Iowa Secretary of State.